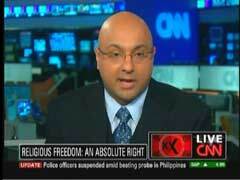 CNN's Velshi: Ban Catholic Churches from Oklahoma City Because of McVeigh? VELSHI: Did you know that, as an American citizen, you have two freedoms granted by the First Amendment of the Constitution, when it comes to religion? The first part is known as the Establishment Clause. The Establishment Clause essentially says the government can't pass laws that will establish an official religion. This is commonly interpreted as the separation of church and state. The second one is the Free Exercise Clause, and it prevents the government from interfering with or controlling a person's practice of his or her religion. Religious freedom is an absolute right in this country, and it includes the right to practice any religion, or no religion at all, for all Americans. VELSHI: Suppose our government leaders or New York state leaders do step in, in some capacity, whether official or non-official, and assist in moving the mosque elsewhere. Then what? What kind of precedent does that set? Timothy McVeigh was raised Catholic. Do we then entertain petitions of moving Catholic churches away from the Oklahoma bombing site? I'm sure you're thinking it sounds ridiculous, but ask yourself, is it ridiculous because Catholicism is familiar to you, or, is your argument that what he did was different, or is your argument that Timothy McVeigh didn't kill in the name in Allah? Actually, the comparison is ridiculous, because, as his own network acknowledged the morning after McVeigh's execution, that the murderer was "baptized in the Catholic Church as a boy, but had stopped practicing and recently described himself as agnostic." Moreover, as the terrorist himself admitted, he bombed the Oklahoma City federal building as a "retaliatory strike; a counter attack, for the cumulative raids (and subsequent violence and damage) that federal agents had participated in over the preceding years (including, but not limited to, Waco)." McVeigh did not carry out the attack in the name of the Christian God or in the name of the Catholic Church. On the other hand, Al Qaeda issued a fatwa in 1998, which declared that killing "Americans and their allies...is an individual duty for every Muslim who can do it in any country in which it is possible to do it...in accordance with the words of Almighty God." Velshi concluded his commentary by stating that it didn't matter whether Americans were for or against the planned mosque: "If you're an American citizen and choose to remain in this country, then whether you are against or you are for the Islamic center and mosque should be irrelevant. I say 'should be,' in an ideal world, because, as an American citizen- well, we should all be for the Constitution that so many have fought, lived, and died for, including the 2,976 souls who died on September 11th at Ground Zero, at the Pentagon, and in a field in western Pennsylvania." The anchor wasn't the first CNN personality to bring in the Catholic Church into the mosque controversy. A week earlier, Rick Sanchez bizarrely wondered whether nvestigating the funding behind the planned mosque near Ground Zero would lead to investigations into Catholic and/or Mormon funding: "If you start going into who is giving money...you've got to go to Rome and start asking where the money is going into Rome....and you have to go the Mormons and ask...what are they doing with their money?" VELSHI: Time now for the 'XYZ' of it. It's a controversial topic: the Islamic center and mosque near Ground Zero. It's an emotional topic, and one I wasn't sure I should bring up in these last few minutes with you, but you've talked about it with me on Facebook and Twitter, so here goes. Did you know that, as an American citizen, you have two freedoms granted by the First Amendment of the Constitution, when it comes to religion? The first part is known as the Establishment Clause. The Establishment Clause essentially says the government can't pass laws that will establish an official religion. This is commonly interpreted as the separation of church and state. The second one is the Free Exercise Clause, and it prevents the government from interfering with or controlling a person's practice of his or her religion. Religious freedom is an absolute right in this country, and it includes the right to practice any religion, or no religion at all, for all Americans. The founders of this country crossed the ocean in the early 1600s, seeking freedom of religion from an oppressive church and government. I don't know how the situation in downtown New York will play out, but I know these are potentially dangerous times for our freedoms. Suppose our government leaders or New York state leaders do step in, in some capacity, whether official or non-official, and assist in moving the mosque elsewhere. Then what? What kind of precedent does that set? Timothy McVeigh was raised Catholic. Do we then entertain petitions of moving Catholic churches away from the Oklahoma bombing site? I'm sure you're thinking it sounds ridiculous, but ask yourself, is it ridiculous because Catholicism is familiar to you, or, is your argument that what he did was different, or is your argument that Timothy McVeigh didn't kill in the name in Allah? For every religion under the heavens, there will always be extremists. The key is to understand that the extremist do not make up the masses. Linda Lee on Facebook wrote to me today, 'Islam and terrorism are not synonymous. By fighting for the mosque [sic] for those reasons, you are supporting bin Laden's idea that the West is at war with Islam. Please don't be the cause of what you are so desperately trying to fight,' end quote.